PAY NOTHING FOR 500 DAYS! Minimum spend $500^ + Promotion valid from 16th April to 13th May 2019. One gift per customer. Offer available while stocks last to customers that meet the spend criteria in one transaction. Not available in conjunction with any other offer. All Eclipse watches are alloy unless otherwise stated. All items 9ct Gold unless otherwise stated. *Items have been ticketed at higher prices in the period before 16th April 2019. Sales may have taken place at prices lower than the ticketed prices. Carat tw = Carat total weight. Created gemstones are grown in strictly controlled laboratory conditions to recreate the brilliance of natural gemstones. Two tone Gold, White Gold, and some Sterling Silver has been rhodium plated to enhance it's appearance. Rhodium plating is not permanent and may require replating in the future. ^Pay nothing for 500 days! Available to approved applicants only, during the promotional period 16th April - 13th May 2019. Minimum spend $500. Fees, terms and conditions apply, see in store for details. All items 9ct Gold unless otherwise stated. ||Pendant and Locket prices include Silver & Gold tone plated display chains only. CZ‡ denotes Cubic Zirconia. xAll pearls are cultured freshwater pearls. All Eclipse watches are alloy unless otherwise stated. DIAMOND STERLING SILVER BRACELET 2003398 A. All items 9ct Gold unless otherwise stated. *Items have been ticketed at higher prices in the period before 16th April 2019. Sales may have taken place at prices lower than the ticketed prices.Carat tw = Carat total weight. ||Pendant prices include Silver, Rose Gold and Gold tone plated display chains only. Two tone Gold, Rose Gold, White Gold and some Sterling Silver has been rhodium plated to enhance it's apperance. Rhodium plating is not permanent and may require replating in the future. All items 9ct Gold unless otherwise stated. All items 9ct Gold unless otherwise stated. *Items have been ticketed at higher prices in the period before 16th April 2019. Sales may have taken place at prices lower than the ticketed prices. Carat tw = Carat total weight. || Pendant prices include Silver and gold tone plated display chains only. Two tone Gold and White Gold has been rhodium plated to enhance it's apperance. Some items have been rhodium plated to give the appearance of two tone. Rhodium plating is not permanent and may require replating in the future. All items 9ct Gold unless otherwise stated. *Items have been ticketed at higher prices in the period before 16th April 2019. Sales may have taken place at prices lower than the ticketed prices. CZ‡ denotes Cubic Zirconia. All Eclipse watches are alloy unless otherwise stated. All items Sterling Silver. *Items have been ticketed at higher prices in the period before 16th April 2019. Sales may have taken place at prices lower than the ticketed prices. || Pendant prices include Silver plated display chains only. Some Sterling Silver has been rhodium plated to enhance it's apperance. CZ‡ denotes Cubic Zirconia. Rhodium plating is not permanent and may require replating in the future. $29* A. CZ‡ TEAR DROP PENDANT|| 2004650 B. All items Sterling Silver unless otherwise stated. All Eclipse watches are alloy unless otherwise stated. All items 9ct Gold. *Items have been ticketed at higher prices in the period before 16th April 2019. Sales may have taken place at prices lower than the ticketed prices. Carat tw = Carat total weight. ||Pendant prices include Silver and Gold tone plated display chains only. Two tone Gold and White Gold has been rhodium plated to enhance it's apperance. Some items have been rhodium plated to give the appearance of two tone. Rhodium plating is not permanent and may require replating in the future. HUSH are Diamond Simulants. All items Sterling Silver unless otherwise stated. CZ‡ denotes Cubic Zirconia. Emozioni Bangles are Stainless Steel with Silver and Rose Gold plated beads. Emozioni chains and keepers are all Sterling Silver with gold or rose gold plating on selected styles. Emozioni Coins are Sterling Silver Plated, Gold Plated or rose gold plated. Hot Diamonds are Sterling Silver with Rose Gold plating on selected styles. Eclipse Jewellery is Austrian Crystal. Swarovski Zirconia is Cubic Zirconia. Emozioni Earrings are Sterling Silver plated or Rose Gold plated. 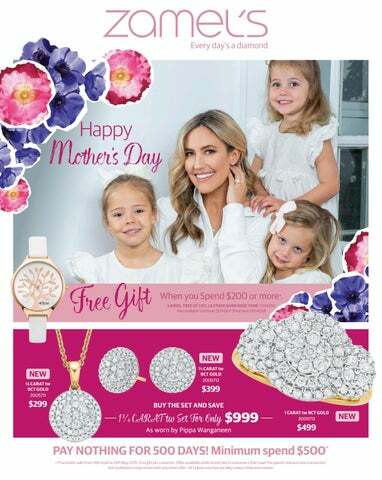 Happy Motherâ&#x20AC;&#x2122;s Day *All items Sterling Silver unless otherwise stated. Except for items marked NEW items have been ticketed at higher prices in the period before 16th April 2019. Sales may have taken place at prices lower than the ticketed prices. Catalogue prices valid 16th April - 13th May or until sold out. We do not accept responsibility for any items advertised in this flyer that may be unavailable due to the circumstances beyond our control. Rain-checks or equivalent goods may be offered if stock is unavailable. Some items not shown at actual size. Colours may vary due to printing process. We reserve the right to correct printing or pricing errors. Carat tw = Carat total weight. ||Pendant price includes Gold tone plated display chain only. XAll pearls are cultured freshwater pearls. Some sterling silver has been rhoduim plated to enhance its apperance. Some items have been rhodium plated to give the appearance of two tone. Rhoduim plating is not permanent and may require replating in the future. CR. denotes created gemstones which are grown in strictly controlled laboratory conditions to recreate the brilliance of natural gemstones. ^NO DEPOSIT & NO INTEREST FOR 500 DAYS! Available to approved applicants only, during the promotional period of 16th April - 13th May 2019. Minimum spend $500. Monthly payments must be made during the promotional period . Interest and payments are payable after the interest free period expires. Paying only the minimum monthly payment will not pay out the purchase before the end of the plan. A $99 annual fee for Gem Visa applies. At the end of the plan, interest will be charged at 24.99%. This notice is given under the Gem Visa Conditions of Use (as applicable), which specify all other conditions for this offer. Also available to CreditLine, GO MasterCard and Buyerâ&#x20AC;&#x2122;s Edge customers. Other conditions, fees and charges apply, see relevant product websites for details. Credit is provided by Latitude Finance Australia. (ABN 42 008 583 588), Australian Credit Licence number 392145. 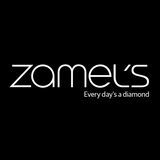 Visit zamels.com.au for store locations.